He defended his actions in a national address, saying he was curbing a rise in extremism in Pakistan. 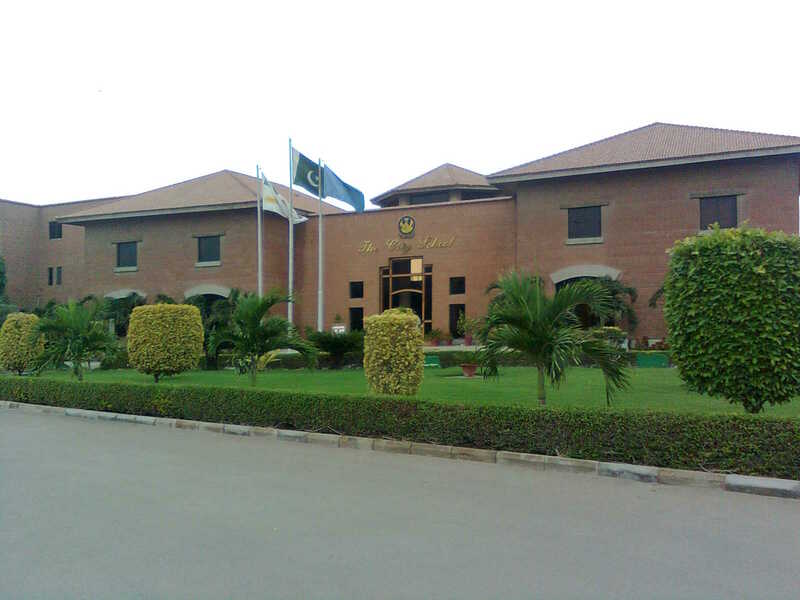 Chief Justice Iftikhar Chaudhry has been replaced and the Supreme Court surrounded by troops, who also entered state-run TV and radio stations. The moves come as the Supreme Court was due to rule on the legality of Gen Musharraf's October election victory. The court was to decide whether Gen Musharraf was eligible to run for re-election last month while remaining army chief. The BBC's Barbara Plett reports from Islamabad that fears had been growing in the government that the Supreme Court ruling could go against Gen Musharraf. Former Prime Minister Benazir Bhutto, who recently returned to the country after years of self-exile to lead her party in planned parliamentary elections, was in Dubai on a personal visit when news of the declaration broke. However, she immediately flew back to Karachi where she condemned Gen Musharraf's decision. It is not clear whether the parliamentary elections due in January will go ahead. Gen Musharraf made no mention of them in his speech, but he insisted he wanted to restore democracy. Pakistan has been engulfed in political upheaval in recent months, and the security forces have suffered a series of blows from pro-Taleban militants opposed to Gen Musharraf's support for the US-led "war on terror". In a lengthy televised speech late on Saturday, Mr Musharraf said the situation had forced him into making "some very painful decisions". "I suspect that Pakistan's sovereignty is in danger unless timely action is taken," he said. He insisted his decisions were made for the benefit of Pakistan. "Extremists are roaming around freely in the country, and they are not scared of law-enforcement agencies," the president said. As well as defending emergency rule to the Pakistani people, Gen Musharraf also appealed directly to his Western allies for patience. "Kindly understand the criticality of the situation in Pakistan and around Pakistan. Pakistan is on the verge of destabilisation," he said. "Inaction at this moment is suicide for Pakistan and I cannot allow this country to commit suicide." US Secretary of State Condoleezza Rice said the declaration of emergency rule was "highly regrettable" and called upon Pakistan to have free and fair elections. UK Foreign Secretary David Miliband also expressed concern, saying it was vital Pakistan's government "abides by the commitment to hold free and fair elections on schedule". Gen Musharraf's address echoed the text of the declaration of emergency rule, which opens with a reference to the "grave threat" posed by the "visible ascendancy in the activities of extremists and incidents of terrorist attacks". It ends by saying that the constitution is in "abeyance" - which, according to our correspondent, in effect means that martial law has been imposed, although there is not a heavy security presence on the streets. The political and judicial core of Islamabad has been shut down, but the rest of the city is functioning normally, our correspondent says. She says it is clear from reading the emergency proclamation the main target is the judiciary which is accused of interfering in government policy and weakening the struggle against terrorism. Chief Justice Chaudhry and eight other judges refused to endorse the emergency order, declaring it unconstitutional, resulting in Mr Chaudhry's dismissal. A new chief justice has been appointed, officials say. He is Supreme Court judge Abdul Hameed Dogar, a supporter of Gen Musharraf who was a member of the special tribunal appointed to investigate allegations of wrongdoing by Mr Chaudhry. Ms Bhutto's return from self-imposed exile last month came about with the co-operation of Gen Musharraf. Our correspondent says that in the changed circumstances she will have to decide whether she is returning to lead the opposition against the president, or should wait on the sidelines in the hopes of securing an agreement with him. A very good step indeed! In light of all thats happening, this emergency was the need of our time, hence it has been fulfilled! "THIS WILL HELP PAKISTAN IN FUTURE"
this is a gud effort by the ppl managing the blog. well done! 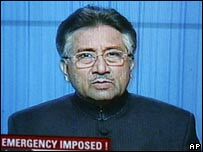 You know whats even more interesting is that If Musharraf had not declared emergency and had taken off his uniform to hold only one position, that being the President of Pakistan, there were great chances that he might've been taken over by Kiani, in a military coup. Musharraf going against the United States of America is rather shocking. 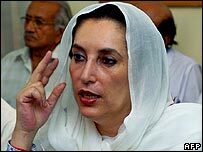 What I feel is that, they want Benazir Bhutto to take over now, may be because she had plegded to let the american forces enter Pakistan in order to fight the islamic activists. This could be a big misunderstanding too. Ive been pro Musharraf all my life. What has happened now is too hard for me and other Musharraf supporters to digest. Pakistan needs sane leadership, the country is full of corrupt politicians, Musharraf was our last hope. I dont see how things are going to get back to normal. According to various sources, most of these lawyers belong to political parties, which is why they are being arrested in great numbers across the country. Something else Id like to add here that ive been hearing, why Musharraf attacked the judiciary, well according to him, the judges and lawyers were easily letting go off most of the culprits who were behind different suicidal attacks that had been taking place since the past 2 to 3 years. Which is why he says, it was more than necessary for him to take an action against the judiciary. It is very difficult to decide who to believe and who not to. There are so many conflicts and controversies being brought up almost on a daily basis. After writing all this, all im going to say is that, there is no point of arguing with each other. It is clear the imposing the emergency was a rather stupid move, and we all agree to that. The people of Pakistan want their rights back, and eventually we will. But what next? Do we want to hand over the responsiblity of bringing the country together to somebody like Benazir? I dont think so. And for all those who think IMRAN KHAN is the only sane leader present in the country..Honestly speaking, it seems like the man himself has some confidence issues since he was kicked by Jemima, but then again his career in politics has been nothing less than a comedy of errors. All he is doing is trying to become a politician of record because his political party, Tehreek-e-Insaaf has not been able to toss him into any real spotlight as one. Its fun listening to him by the way, as he defends his political incompetence by saying it’s a Banana Repulic Country and A Rubber Stamp Parliament for a dictator as President. Whats even funnier is that he refused to serve the nation first as Prime Minister and then again as Chairman of the Pakistan Cricket Board. I mean, what does the man want? Also, the very first time when he launched himself into politics, he swore that if elected, he would hang every corrupt person in the country and what not, needless to say he lost that election. Then he kept changing his position, only to lose again. Today hes being called names such as, the warrior for justice and others I do not even feel like mentioning because they are rather amusing, huh. He has formed a political alliance with those same people that he wanted to hang when he came into politics..anything for a chance at power..eh? You know he might be a good cricketer, socialite and so on. But he is no politician. the most irritating thing is that all pakistani news channels have been blocked and its looking like that we are living in a village or something like that without any information of the country.